The American Indian name for the hero of Assassin's Creed III is "Ratohnhaké:ton." Somehow, that Anglicizes to "Connor Kenway." His last name came to light this week, and it's there on Ubisoft's official site. 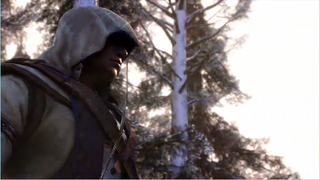 So there you go: La'Ahad (Altaïr), Auditore (Ezio) and now ... Kenway. Sounds like an appliance to me, though I realize that the recognizable brand of refrigerator is Kenmore, not Kenway. So here's what Google churned up on a search for that word. • First listing: A janitorial supply and services company based in Louisville, Kentucky. • Third listing: A maker of drain-cleaning equipment. Do we sense a theme? • Eighth listing: The English former cricketer Derek Kenway. According to his bio on Wikipedia, he is currently a roofer. • 15th listing: The aforementioned Connor Kenway. There you have it: Kenway—your trusted name in home maintenance, and battling centuries-long global conspiracies. And counter-kills.